Check-in for Emirates is in area C of the main terminal building at Birmingham and initial signage makes finding the area very easy. The check-in area benefits from excellent branding and queue management, giving a very positive first impression to customers. I checked in relatively early for the flight and so queuing time was a short 2 to 3 minutes. Emirates use 11 desks in total and so the queue moves forward at a quick pace. It is worth noting Emirates usually use their high-density A380 configuration on this Birmingham route and with potential for over 600 passengers, getting there early has some obvious advantages. Proactive roaming staff help to direct passengers and the service offered by the check-in staff was good, although disappointingly no seat selection was available. Emirates use 2 gates, 1 for lower deck passengers, the other for the upper deck, including Business Class. This is clearly communicated by staff and has a notable impact on the efficiency of boarding. The gate areas in Birmingham are quite small and numerous passengers are left standing or sitting on the floor. Passengers are called forward according zone number and with proactive checks being made to those queueing up it is almost impossible to board until your zone is called. The flight is pretty much full so the boarding experience does feel slightly chaotic – the staff are as efficient as possible but there is limited space and too many passengers and the experience is cramped and unpleasant. A380 in Economy Class was at approximately 95% capacity. Emirates changed their checked baggage policy in June 2016 and it now varies in Economy Class depending on your ticket type. Those on the cheapest fares can expect a 20Kg baggage limit and this increases to an impressive 35kg for the most expensive Economy Class fares. Unlike many airlines this can include as many bags as you like (outside North and South America). 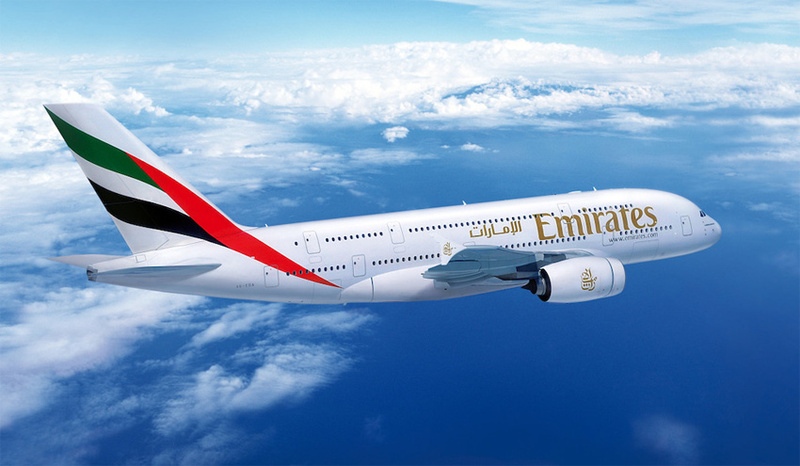 Emirates allow a 7kg cabin bag – unlike several international carriers they do not accept a second smaller laptop bag / hand bag. On paper this is restrictive, but the rule appears quite relaxed and numerous passengers were observed with a second bag in the cabin. Economy Class on this A380 is located throughout the lower deck, with 3x4x3 configuration, and a 32-inch seat pitch. The seat feels surprisingly spacious and provides good comfort this 6.5-hour flight. The product is not the most recent Economy Class seat but benefits from a USB port, and an international charging socket (2 available per row). 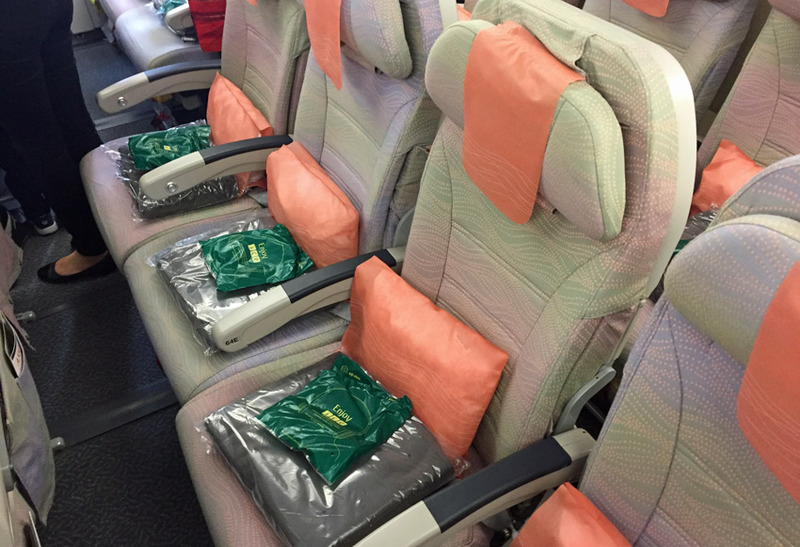 Seat padding and general comfort are most satisfactory and comparable to Emirates regional competitors. For most flights between Birmingham and Dubai, Emirates use the higher density, 2 class A380, with 120 Economy Class seats located on the upper deck. These seats benefit from a more spacious 2x4x2 configuration with larger washrooms and we suggest trying to get one of these for your flight. The cabin is good condition on boarding and is well cleaned from the previous flight. The seats and other fixtures and fittings are well maintained and presented nicely. The washrooms are smart but cleanliness is an issue by the end of the flight. Staff clearly take quite a relaxed approach when it comes to cleaning the washrooms and conditions are quite messy just prior to arrival. The flight departs 30 minutes late from Birmingham and arrives 10 minutes behind schedule. There is no explanation or apology for the delay from the cabin staff or flight deck. Beverages are served 40 minutes after departure alongside a small packet of nuts. The beverage selection is good, with numerous soft drinks alongside, wine, spirits and beers. The meal trays do not appear until 2 hours after departure, and for those passengers at the back of the cabin, this is closer to 2.5 hours. It is very slow for a relatively short flight. Even for the service challenges bought on by the size of Economy Class on this aircraft this did seem like an unnecessarily long time. The quality of the meal tray and the food itself is excellent. 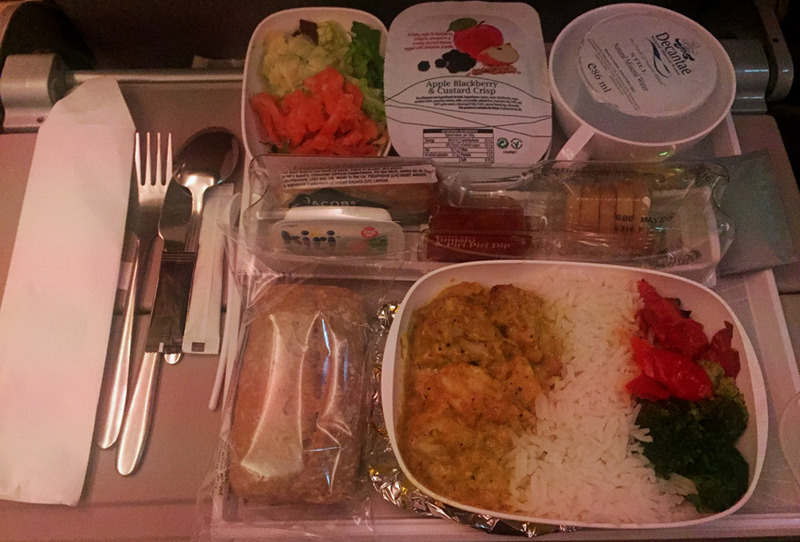 The meal is nicely presented and the main entrée is a generous portion for Economy Class. The small enhancements, such as the chocolate, Tic-Tacs and chili tip being unusual but nice additions to the meal tray. The food is excellent with regards to both flavour and presentation. Passengers have a choice of 2 entrées, and the chicken dish selected is delicious. The appetiser and dessert are also nice and overall, this was a very enjoyable Economy Class meal. This essentially concludes the food and beverage service for this flight with just a small tub of ice cream offered 90-minutes before arrival. Most of Emirates regional competitors still offer a hot snack and beverage before arrival (on flights of a similar length) and perhaps this indicates the slow meal service is by design to spread out the food offer more “efficiently”. 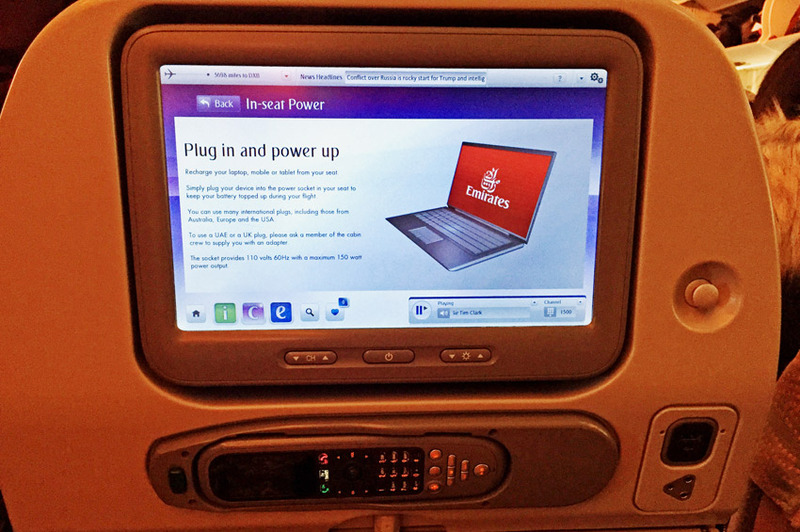 Inflight entertainment is an area where Emirates excel. The ICE inflight system has been recently upgraded and offers 2,186 channels making up nearly 4,300 hours of entertainment. This includes 50 full box sets of TV programmes, nearly 600 movies and 1,230 music options. WiFi was available on the flight and in this area also Emirates offers an excellent product. Every passenger gets 10MB of free data to use over a maximum 2-hour period but for only $1USD passengers can have access to 500mb of data, and the connection speed is good enough to look through social media, load websites or send emails. As this is an older A380 it did not have the larger 13.3 inch PTV which is available in the latest cabins – however, the screen size and quality is comparable to many other carriers and is perfectly satisfactory. Passengers are provided with a pillow and blanket. The pillow is of reasonable quality – the blanket is one of the largest I’ve seen offered in Economy Class and is a nice product. Passengers are given a small disposable refreshment towel prior to take-off and a much nicer cotton towel before landing. There are no other amenity items such as eye mask, ear plugs etc and a few airlines still offer this product. 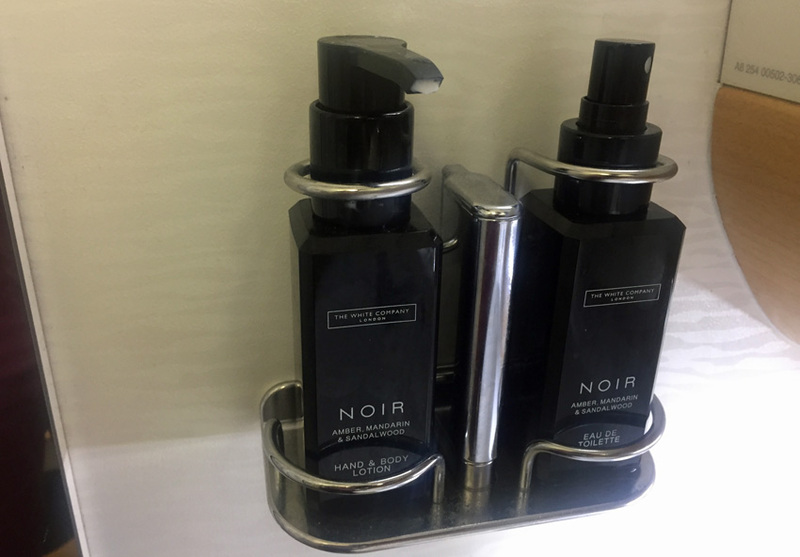 In the washrooms there are very nice amenities from London based, The White Company and this includes a hand lotion and eau de toilette. If the IFE was the highlight of the flight, the staff service was the most disappointing. There were several instances where crew members appear rude and impatient and display quite poor standards of customer service. Small service features like the placing down of the meal tray is done with no care or attention whilst the flight announcements are so rushed by the staff they lacked any sort of sincerity. There is nothing beyond the bare minimum of service available on this flight and for all the glitzy marketing that Emirates portray, this is a disappointing last memory of the flight. With so many of Emirates passengers moving onto a second destination, the transfer in Dubai is a crucial element of ground service. For passengers with a tight connection staff are available when leaving the aircraft and will offer directions to skip security queues. For this A380 flight, there are only 2 staff available and they clearly struggle to deal with the volume of passengers. The transfer desk area and associated signage is clear and another example of very strong Emirates branding. The service at these desks are rudimentary at best, and staff deal with passengers as quickly as possible. The poor levels of staff service put a very negative spin on a what was otherwise a positive flight experience. The slow service caused some frustration in the cabin, but the meal product is excellent and it is a shame this is not backed up by a more substantial arrivals service – which could at least offer a beverage with the ice cream. Inflight entertainment is simply the best I have experience and the WiFi access, at such a good price, is superb. Whilst in Economy Class I do not expect a tailored and individual service experience I would at least expect staff to be polite and engaging with passengers.